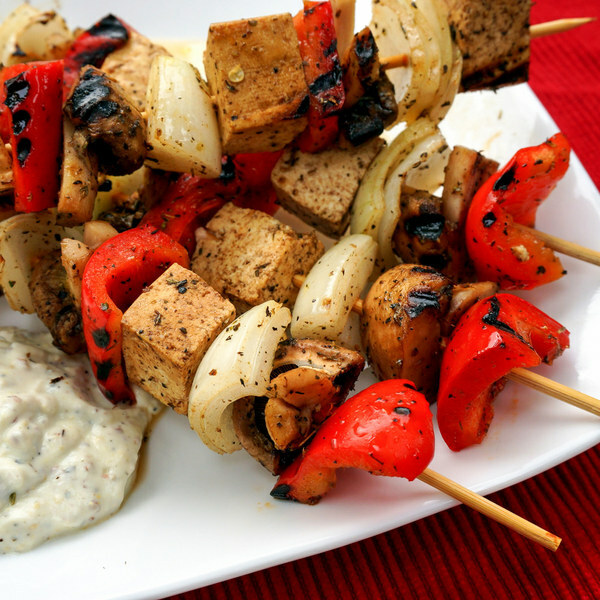 ← Balsamic Tofu & Veggie Kebabs with Minted Yogurt Sauce. Peel and mince garlic. Wash and dry mint. Pick the leaves off the stems; discard the stems and mince the leaves. In a large bowl, prepare marinade by whisking together ½ of the garlic and mint (save the rest for the sauce), oil, vinegar, salt, and pepper. Drain and medium dice tofu; place on paper towels and pat dry. Add to bowl with marinade and toss to coat. Set aside. Wash and dry bell pepper and mushrooms. Seed and large dice the bell pepper. Halve the mushrooms. Peel and large dice onion. Add vegetables to bowl with tofu and toss. Heat a grill pan, outdoor grill, or skillet over medium-high heat. Thread tofu and vegetables onto skewers. Alternatively, you can cook the tofu and vegetable pieces directly on the grill/skillet without skewers. Coat grill or bottom of skillet with oil. Add tofu and vegetables; cook, turning occasionally, until tofu is browned and vegetables are tender, 8-10 minutes total. In a small bowl, prepare sauce by whisking together yogurt, salt, pepper, and remaining garlic and mint. To serve, place kebabs on a plate with yogurt sauce on the side. Enjoy!